USPS Hold Mail Service allows your local Post Office to stop mail delivery if you’re out of town or otherwise need to suspend home delivery for at least three days and for a maximum of 30 days. If you’re concerned about letters piling up in your home mailbox or shared mailroom in your absence, Hold Mail is a great option to consider. How Does USPS Hold Mail Work? First, check to ensure Hold Mail is available to you. On the USPS website, fill out your information on the online form to learn if you can use this service. (Note: Hold Mail holds mail per address, not per individual, so be sure your family or housemates agree to the service.) You may also call 1-800-ASK-USPS, or visit your local Post Office. How long do you need your mail held by USPS? Be aware that Hold Mail isn’t intended for changes in residence, or for periods longer than 30 days. For longer-term temporary delivery, such as for a summer home or for a college student living at school, you’ll want to look into USPS Forward Mail Service or USPS Premium Forwarding Service. If you’re permanently changing your residence, fill out a Change of Address form. Decide how you’ll get your mail once your Hold Mail Service ends. Delivery returns to its original schedule the day after your End Hold Date. For example, if your End Hold date was October 4, regular operations will resume on October 5. What Else Should I Know About Hold Mail? Plan ahead ... or not! If you want Hold Mail Service, you can let the Post Office know as far out as 30 days from your initial hold date, or as late as the day before your next scheduled delivery date. Be prepared for the onslaught of mail when your Hold Mail option ends. 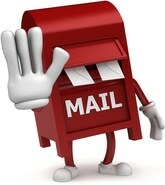 Understand that deliverable held mail only applies to pieces that fit in your mail receptacle. For larger items and packages, or if the volume of held mail doesn’t fit in your mailbox on your requested re-delivery day, you’ll receive a notice to pick up the remainder directly from the Post Office. Have a plan for non-USPS deliveries. If you receive shipments from carriers other than USPS, be sure a friend or neighbor is checking your door for you, or contact the shippers directly to see if they too offer options for holding or redelivering pieces.